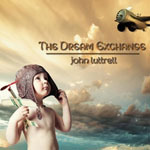 Share the post "Album review: JOHN LUTTRELL – The Dream Exchange"
In the mid-late 1980s there was a fad for what was termed ‘new age’ music which produced ambient albums in their abundance and presaged the “chill-out” genre a decade later. Some nasty critics likened the genre to glorified wallpaper music but the best of it was always very musical and engaging, even if a little bit “background”. Perhaps in the late-1980s we all needed respite from the “loadsa money” culture and refuge was sought in musical textures that enveloped and soothed the listener. Or perhaps we just wanted respite from Pet Shop Boys. Ironically, there may even be an increased need for ambient diversion in our economy-torn age. ’The Dream Exchange’ might – at least – make you dig out your scented candles and a tea tree face mask. John Luttrell, born in Venezuela, once domiciled in London, now in California, earned his musical spurs in various semi-prog bands and more recently producing niche works in the new age idiom. Luttrell is a talented guitarist and creates sweeping soundscapes throughout this latest work. It reminds me of the sort of thing John Themis was doing back in the day and resurrects memories of the Coda Records label he recorded for. This is an album to have on when you want to soothe that furled brow, kick off your shoes, and reflect on the day gone by. Not for nothing is there a track called ‘Somnambulistic Journey’. This entry was posted in ALBUM REVIEWS, ALBUM REVIEWS (Mobile), All Posts and tagged album, ambient, guitar, guitarist, instrumental, John Luttrell, new age, review, The Dream Exchange. Bookmark the permalink.